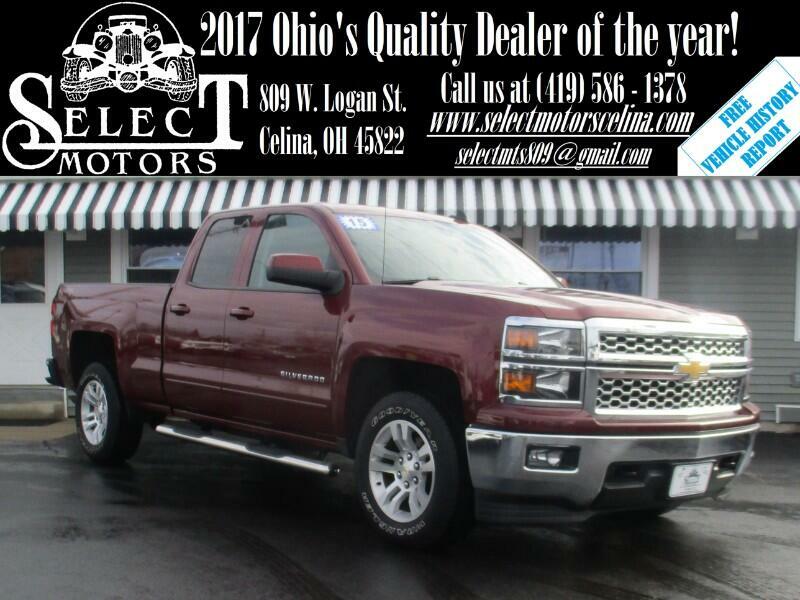 ***TXT US @: (419) 362 - 6200*** 5.3L V8, 4x4, Heated cloth seats, Backup camera, Bluetooth, automatic headlights, automatic dimming mirror, compass, outside temperature, blind spot mirrors, A/C, dual automatic climate controls, power windows/locks/mirrors, keyless entry with remote start, AM/FM, SiriusXM, auxiliary and USB port, steering wheel mounted audio controls, power seat with power lumbar, tilt and telescopic steering wheel, cruise control, information center, 18" alloy wheels. Warranties: Balance of Chevy's 5 year or 100,000 mile powertrain. In service date: 12/29/2015. Extended service contracts available. The 2015 Chevrolet Silverado 1500 is a full-size pickup offered in a variety of cab/cargo-bed configurations in both two- and four-wheel drive. Body styles include regular cab, extended ("Double") cab and crew cab. Regular cabs can be had with either a 6.5-foot standard bed or an 8.2-foot bed. Extended cabs come only with the 6.5-foot standard bed, while crew cabs can be had with either a 5.75-foot short bed or the 6.5-foot standard bed. Regular cabs are limited to the Work Truck (WT), LS and LT trims. The extended cabs come in WT, LT, LS and LTZ trims while the crew cab comes in all the aforementioned trim levels, plus the plush High Country and off-road-oriented Z71 trims. The WT comes with 17-inch steel wheels, tinted glass, air-conditioning, cruise control, power door locks, a tilt-only steering column, vinyl seating, rubber floor covering, a 40/20/40-split front bench seat and a four-speaker AM/FM sound system with USB and auxiliary inputs. The LS adds stainless steel finish wheels, chrome bumpers and grille, power and heated mirrors, deep-tinted glass, power windows, keyless entry, Bluetooth phone and audio connectivity, OnStar with 4G LTE WiFi and an upgraded MyLink audio system with a 4.2-inch color display, satellite radio, Pandora radio, a CD player and voice control functionality. The LTZ piles on chrome trim, 18-inch alloy wheels, remote starting, power folding mirrors, a power sliding rear window, a tilt-and-telescoping steering wheel, an auto-dimming rearview mirror, a rearview camera, a 110-volt power outlet, dual-zone automatic climate control, leather upholstery, heated eight-way power driver and passenger front seats with two-way adjustable lumbar, driver seat memory settings and an 8-inch touchscreen display for the MyLink interface. In addition to the LTZ features, the High Country includes a unique grille, 20-inch wheels, front and rear parking sensors, cargo box tie-downs, a spray-on bedliner, a Bose audio system, 10-way power front seats and ventilated front seats.